The purpose of the group is to instigate a plan of work, raise funds and carry out such work to bring the St Michael’s Church building and its churchyard to an acceptable standard for the benefit of worshippers, the general community and visitors alike. The implementation of this purpose is managed through a locally constituted committee which meets on a regular basis to ensure that progress is monitored and decisions made and recorded in a professional manner. It is planned the final outcome of the project will be for the local community to have a church, fit for purpose that encourages worship and enhances the historical and environmental importance of the site for visitors. a fully accessible WC in the North West corner of the nave connected to an existing sewer. a catering point in the South West corner of the nave with base units, worktop and sink. removal of the rear banks of pews and relocation of the font to free up space. removal and replacement of all other pews for more comfortable pews/chairs which will be arranged semi-permanently to allow more flexibility in the use of space. creation of a single floor level throughout the nave at the level of the existing central aisle. built-in storage in oak at low level on the north side of the nave e.g for folding tables and chairs. realignment and alterations to the vestry and chancel areas. redecoration of all wall surfaces with paint materials which will permit the stone construction to breathe. Following detailed discussions, final specifications have now been agreed with our architects and an application for a faculty to allow the work was submitted to the Diocesan Advisory Committee (DAC) in December 2018. The DAC is making a visit to St Michael's in February 2019 to review the faculty with the Restoration Committee and it is hoped that a green light will be received by early spring. This should allow planning and procurement work to begin later in the spring with overall completion forecast for the first half of 2020. 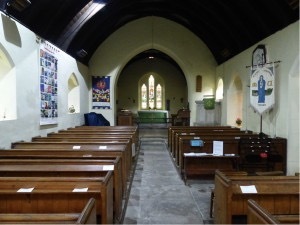 To minimise interruption to church activities, it is planned that the project will proceed in three distinct phases based around the vestry, nave and chancel. The restoration work for this remaining 15th century part of the church was completed in 2013 and is now used as the building’s principal entrance. For a long time, the porch had been locked and out of use owing to the danger posed by loose horizontal ribs in the ceiling structure. 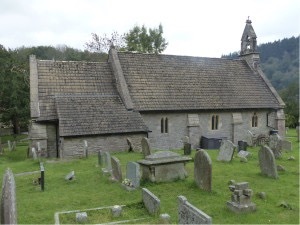 Following an arduous approval process with the Diocesan authorities, permission was finally granted for a complete overhaul, including improvements to the stonework, comprehensive timber replacement and repair, and replacement of the roof tiles with Welsh slate. The work was carried out by Brownstone Construction and was paid for from existing funds. Although repair-only work was considered it was thought it would make more long term economic sense to replace the current precast concrete tiles with slate which would be more sympathetic to the style of this historic building. Full authority to commence work was received early in 2017 from the church authorities and progressed during the summer with completion in September 2017. 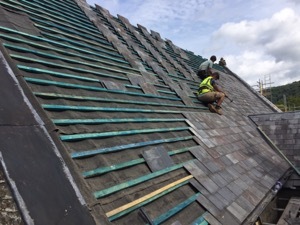 This work carried out by Taliesin Construction included a comprehensive inspection of the roof, the refurbishment and where necessary replacement of the roof timbers and re-roofing with Welsh slate tiles. Bat surveys were carried out by our ecologist to the satisfaction of Natural Resources Wales and a necessary license has been issued. The funding for this work was made up of grants from the Listed Places of Worship Roof Repair Fund and the Headley Trust with the balance covered by existing church funds. 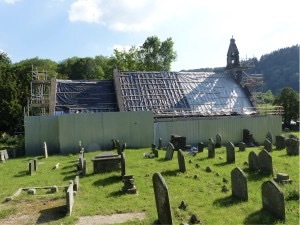 We are pleased to acknowledge the financial assistance provided by the Listed Places of Worship Roof Repair Fund which made a grant towards the roofing costs of £43,000 after a competitive bid by St Michael's Restoration Committee. The outer double doors at the west end of the church were rotting at the base and in a general poor condition. As a consequence It was decided to replace them on a like-for-like basis with a completely new pair using the same design and furniture, utilising dry oak with arched tongued and grooved rebated construction. Existing door ironwork was removed, refurbished and refitted. The door surrounds and internal woodwork above the doors as necessary were removed and refitted and a protective coating applied to the finished installation. The work was completed in 2014. 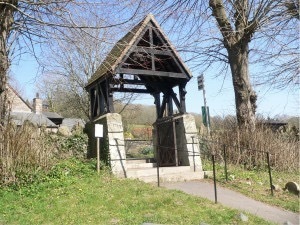 The Lychgate was installed some 40 years ago and due to a lack of maintenance over the years the side structures had become infested with woodworm and beetle. As a consequence an urgent plan of restoration was undertaken and the existing timbers were replaced with dry oak and treated with preservatives. 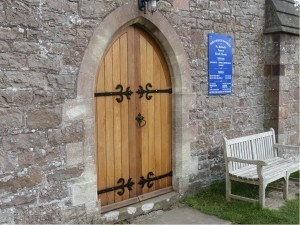 This work was completed at the end of 2011 and we can now be assured of having a Lychgate that will last for many years. This project has been supported by the Sustainable Development Fund, a Defra initiative in the Wye Valley Area of Outstanding Natural Beauty (AONB), the Welsh Church Act Fund and the TCC. 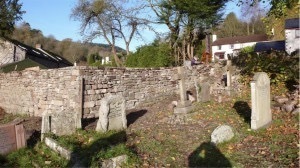 The drystone wall forming a boundary between the Parva B & B and the churchyard was in a poor state and inherently unsafe. 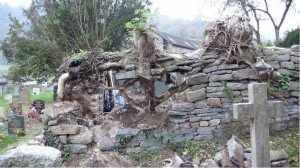 Long term tree growth and ivy infestation had destroyed the fabric of the wall. As a consequence urgent work was commissioned to place the wall in a safe condition and to make the area aesthically pleasing. 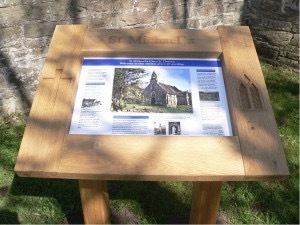 This was designed by Andrew Reid and has now been installed by the path along the side of the church. It gives further information on the church and its historical context for both villagers and visitors. This project has also been supported by the Sustainable Development Fund, a Defra initiative in the Wye Valley Area of Outstanding Natural Beauty (AONB). 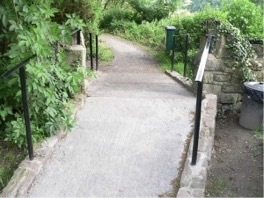 Because the area surrounding the gate on the public footpath at the field end of the churchyard was in danger of flooding the Committee felt it was sensible to install a ramp to bring the level of the path above anticipated levels of flood water. This work was carried out earlier in 2012. The cost was funded from existing monies in the church restoration account. Other items purchased in 2012 included a High Security Storage Shed for much needed additional storage space and a Digital Organ. The latter item was supported by a grant from the Welsh Church Act Fund. 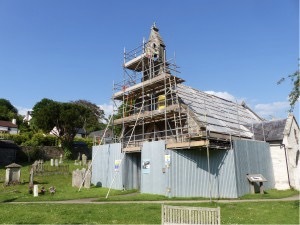 Work continues on the general maintenance of the church and its churchyard. The Committee is very appreciative of local support and hope this continues so eventually we are able to fully preserve this very special historical and religious site. 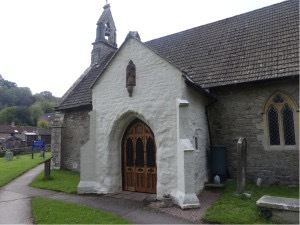 Any help with the project from residents will always be welcome, particularly those who have any expertise concerning such matters as grant applications and fund raising ideas but also those who can spare an hour or two in helping around the church and the churchyard. In the meantime if any readers require further information concerning the project please contact Alan Hillard whose contact details are below.